If you are like many of us you are alternately amazed, overwhelmed and confused by the barrage of information that is fed to you through your breed organizations, cattle committees and industry publications. 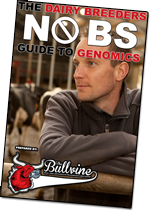 As part of The Bullvine`s commitment to be an informative and understandable resource for cattle breeders, I have spent considerable time trying to get my non-scientific head around the 2011 paper in the Journal of Dairy Science entitled, “Novel strategies to minimize progeny inbreeding while maximizing genetic gain using genomic information.” Was it worth the bother? Yes. Definitely. We can all agree that Genomic information is a tremendous breakthrough for cattle breeding. With all the potential, it didn’t take long for the concern to arise that greater rates of genetic gain could lead to higher annual rates of inbreeding. My wild imagination skipped to a picture of everyone breeding to the top bulls and ending up with a single family. Even if that seems outrageous, it is definitely possible that generation intervals could be halved through taking advantage of the accurate GEBV’s available at birth and this could increase the inbreeding per year. Therefore, I definitely wanted to find out from this paper published by Pryce, Hayes and Goddard in Australia on how genomic information offers possibilities to control the level of progeny inbreeding. Concern: Are we moving from homogenized milk to homozygous cows? Genomic predictions are both cost effective and highly accurate. Therefore there is the very definite potential to accelerate the rate of genetic gain beyond that achieved through progeny testing. Shorter generation intervals could result in large numbers of animals who are similar in genetic makeup due to the sires used. It’s human nature to aim for the best. The uptake of genomics has been beyond anything previously predicted or imagined. Not only is the playing field being leveled it is being dramatically narrowed down. An important part of this Australian study was to evaluate the effect of the three strategies tested on the homozygosity of deleterious recessives. In other words, what can breeders do to limit the potential for negative effects of inbreeding? Before, we go further, it is interesting to note, that these researchers referenced more than twenty other research papers. The focus on this subject is concentrated and that can only be good for the eventual outcome for breeder decision making. The main limitation of comparing methods to predict progeny inbreeding is that, at this time, there is no best practice for measuring inbreeding. Pedigree is flawed by errors and gaps and often, particularly in commercial herds, the depth of pedigree. Genomic relationships calculated using SNP data could have errors from incorrect identification of samples. Again I know sounds very complex. So let’s try and break it down. One of the underlying processes of inbreeding is that it increases the frequency of both favorable and deleterious homozygotes. ROH stands for run of homozygosity. If the occurrence of deleterious homozygotes is more likely to arise as a consequence of recent inbreeding (which is the potential of heavy use of genomics) then strategies to minimize ROH could be a way of reducing them. A novel approach, don’t you agree? In the research simulation they used 300 cows with 20 sires available for mating, replicated 50 times. Each of the 300 individuals allocated as dams were matched to 1 of 20 sires to maximize genetic merit minus the penalty for estimated progeny inbreeding and given the restriction that the sire could not be mated to more than 10% of the cows. In the discussion part of the paper, which, of course, is the easiest part to understand they offer this: “The results presented here show that using A GRM instead of pedigree in a mating plan is an effective way to reduce the expected inbreeding in progeny, with minimal effect on the genetic gain for the inbreeding objective.” The breeding objective in Australia is expressed as APR and in Canada it is LPI and in the US is TPI. Before we go on to look at the financial aspect of this discussion, you should refer to the Genomic Evaluation Details which are available from CDN (Canadian Dairy Network) or from your breed association. In the CDN report there is a column that gives the percentage inbreeding (%ING) numbers for the Sire; Dam and MGS. In general it could be agreed that 0-8 is good; 8 to 10 is okay: 11 to 14 watch and 15 or more take action. What is the Dollar Difference of Inbreeding? By itself this economic benefit does not currently justify the investment in whole herd genotyping, if one considers that pedigree information is free and appears to do a pretty good job of controlling inbreeding, However, it may be economically worthwhile for dairy farmers to invest in whole-herd low-density genotyping in conjunction with other uses of genotyping. Examples could include confirming parentage, selecting the best heifer calves to keep as herd replacements, managing genetic defects, flushing and selling high-value pedigree stock. These researchers conclude: “Based on our calculations the value of genotyping to control inbreeding could be worth between $5 and $10 per cow.” You do the math. So this is my untrained, non-scientific understanding of this single paper on a subject that is growing faster than gossip on a grapevine. Having said that, it is each dairy breeder’s job to be informed. Use your network to find out who has the best answers to this question because when it comes down to the affect of inbreeding on YOUR breeding bottom line it’s YOUR money!